I recently returned from a family reunion that was held in Beantown (Boston, MA), and I was actually impressed with the Boston Logan airport. Really, an airport! Yes, those dirty places with crying kids, long lines, and high prices for bottled water and gum. I've been through the airport many, many times, but never did I notice the "golden statue." 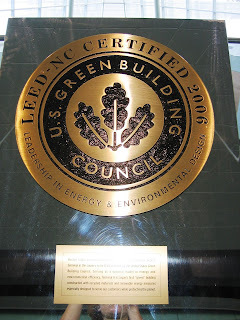 It is a plaque that highlights Boston Logan for being LEED certified. In fact, I later found out it is first airport to be LEED certified. Why is that important you ask? Not only is it cool to have features like a heat-reflecting roof and windows, low-flow faucets and waterless urinals and self-dimming lights, it is also a big saver when it comes down to the bottom line. According to the director of capital programs and environmental affairs at the Massachusetts Port Authority, "We want to be responsible to the environment and our neighbors and minimize the environmental impact. The technology will save the terminal almost $300,000 in electric bills and 1.7 million gallons of water a year." If you need a taxi once you get there, then they have a great option allowing you choose hybrid vehicles for pick-ups and drop-offs. You can schedule reservations online and the best feature is it doesn't cost more for a green taxi cab compared to the traditional yellow cab. You might even learn a thing or two sitting in the back of a green cab with a new perspective.